Parking garages have an obvious and well-defined purpose for cities and municipalities: saving space by going vertical and offering drivers a safe and secure alternative to street parking. However, building owners and municipalities, now more than ever, are pushing for more ambitious designs to improve the human experience and the surrounding community. 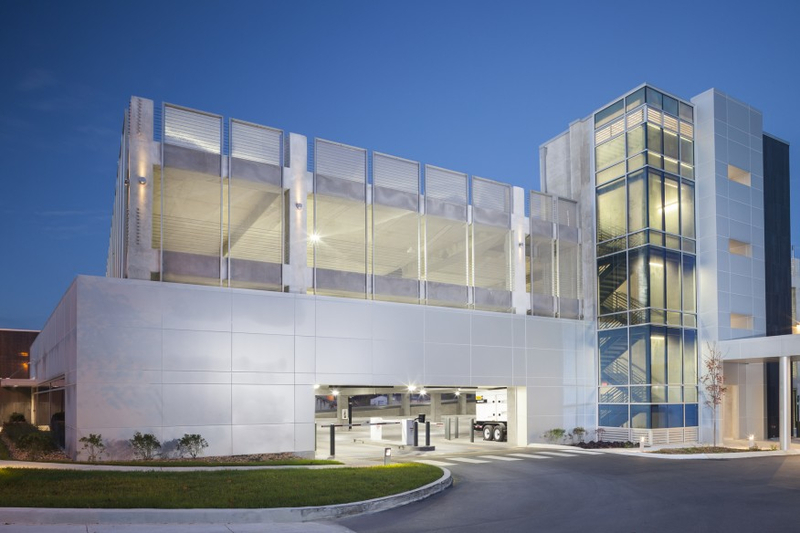 Enter beautiful and dramatic visual elements and materials, which are taking parking garages beyond steel framing and slabs of concrete. For HCA’s corporate headquarters, located in an urban overlay zone in Nashville, Tennessee, the law actually required enhanced design features as part of these standards. Of course, all of the functional requirements needed to be met too—most notably ventilation, fall protection, and parking space size. But 4,000 square feet of stainless steel coiled wire fabric solved the issue—defining its architectural style and meeting performance needs. The urban overlay zone required that the structure have an articulated façade to minimize its visual impact and to add life to the street. The overlay standards are put in place to ensure that new building designs are consistent with the existing character of the area. The coiled wire fabric panels also provide the necessary ventilation for the parking garage to meet code. The fabric is uniquely designed to be simultaneously open and closed—a barrier that provides safety, gives occupants visibility out, and allows air to flow through. Coiled wire fabric is an affordable and versatile architectural design component. Its exceptional functionality is on par with and even surpasses some pricier exterior cladding materials on the market today. The coiled wire fabric was engineered to attach to the garage using Cascade Architectural Borderline attachment system, which incorporated powder coated carbon steel framing integrated with top and bottom rods to tension the fabric. Architects look forward to working with manufacturers that can pre-engineer systems at their facilities, ship them, and have them delivered ready to install. For HCA, the fabric is tensioned within the frame, resulting in a dead load, and eliminating the need to add additional supports to the existing structure. The unitized system allowed for a much faster installation—ultimately saving the client and construction team time and money. The Collaborative Studio team knew they needed a low-maintenance and durable product. Stainless steel coiled wire fabric was the perfect solution. It is highly resistant to corrosion and oxidation, which is important for exterior applications, and will maintain its luster year after year. Cascade Architectural, a division of Cascade Coil, provided the fully engineered coiled wire fabric systems for the HCA Building 4 parking garage, and is the world’s leading manufacturer of coiled wire fabrics for a wide variety of applications. Cascade Architectural provides Fabricoil® architectural coiled wire fabric and their engineered attachment systems for architects and designers around the world.